Guys!! I haven’t brought up the garden in forEVer! But guess what? It’s still going really strong. I sort of stopped blogging about the garden when Nick was away a lot. The truth is, the aquaponic garden is a lot of work. Nick loves working on it, but I just don’t love the science-y aspect of keeping all the water levels on target, not to mention that I don’t enjoy all the pest invasions that come with an enclosed greenhouse. Long story short, when Nick was on deployment and I was feeling sick in my first trimester and barely moving from the couch, the greenhouse was a bit neglected. The water levels got out of control (probably from a fish dying and spiking the ammonia) and all our fishies kicked the bucket. Without enough fish fertilizer, some of the plants suffered. But luckily, not many of them actually died! And as soon as Nick got home he got the water leveled out, added some new fish (we decided to forgo tilapia this time and stick with heartier goldfish) and now our plants are thriving. 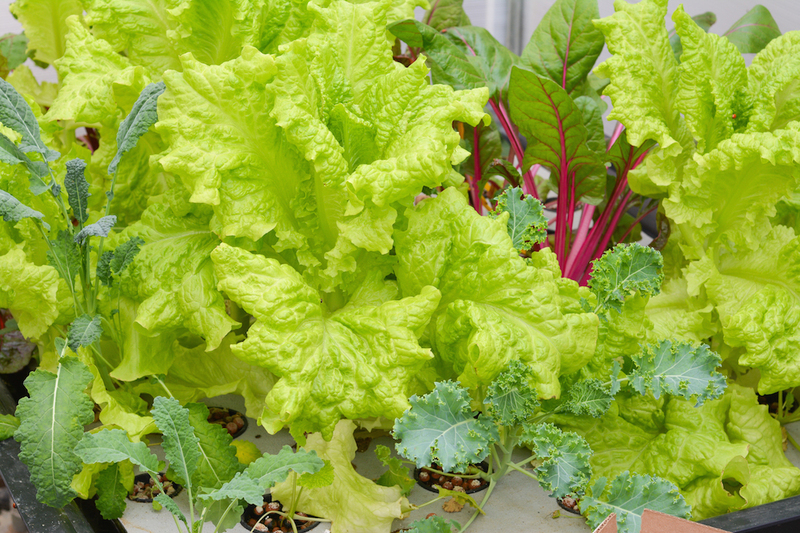 It’s greens season, so we’ve got lettuce, chard, beets and kale a plenty. And soon it will be time to start our summer favorites– tomatoes, cucumbers, peppers. One thing we used to do a lot of with all of our greens was turn them into juice. Juicing your own fruits and veggies is one of those things that’s really, really fun when it’s new and exciting. But then you realize what a pain cleaning the juicer is! Especially since Nick was gone, making juice for just myself really wasn’t worth the hassle of diligently washing all the veggies, making a mess in the kitchen, and then cleaning the dang juicer. But I still love drinking fresh fruit and veggies juices, even more so now that I’m trying to take in extra vitamins and nutrients for baby, so I’m so glad that cold pressed juices have become so popular in grocery stores! 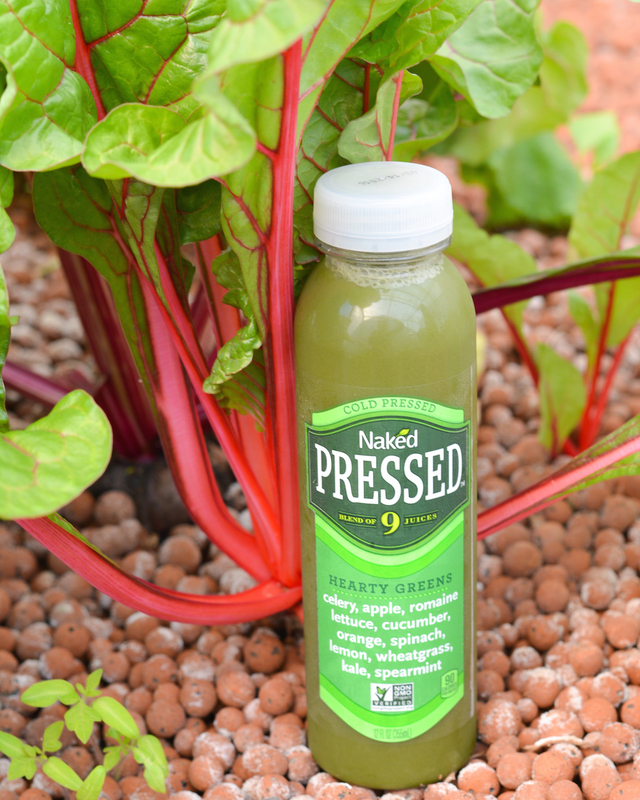 It seems like not too long ago, cold pressed preservative- and additive-free juices were only available at health stores, but now they are so widely available. 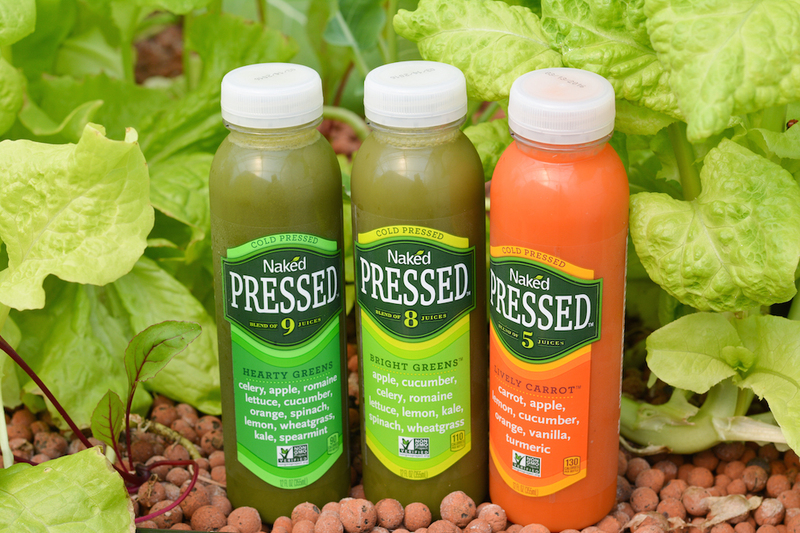 And Naked juices are now jumping on the bandwagon with their new Naked Pressed line! Right now Naked Pressed is available in West Coast stores and is coming soon nationwide. I was super excited to see a brand I know and love (I lived on Naked Green Machine juice in my first trimester when I had zero interest in eating anything even remotely resembling a vegetable) come out with such an awesome product! The Naked Cold Pressed Juices have no added sugars (so many “healthy” juices out there do) and no preservatives, aka no weird non-pronounceable ingredients. Plus they’re verified by the Non GMO Project… all good things in my book. I wanted to try all the flavors, so I picked up one of each. Bright Greens – Apple, cucumber, celery, lettuce, lemon, kale, spinach and wheatgrass. Hearty Greens – Celery, apple, lettuce, cucumber, orange, spinach, lemon, wheatgrass and kale with a hint of spearmint. Lively Carrot – Carrot, apple, orange, cucumber, lemon with a hint of vanilla and turmeric. Bold Beet – Beet, carrot, cucumber, apple, lemon, orange and ginger. 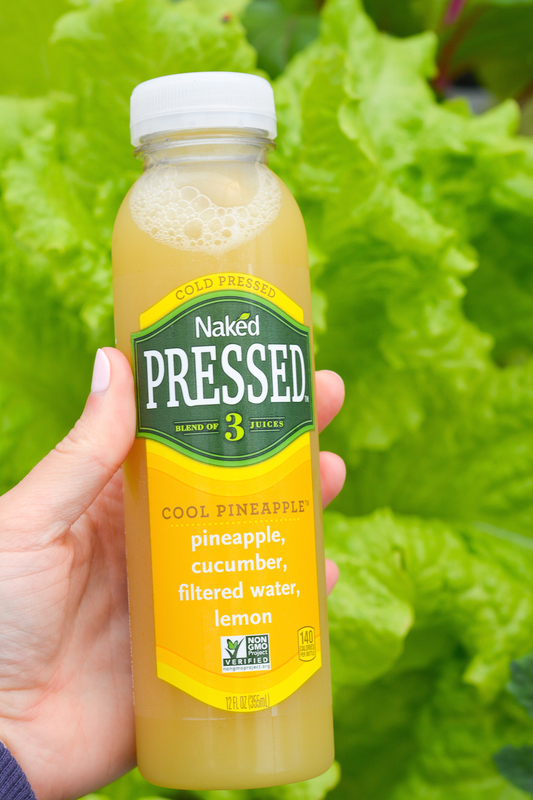 Cool Pineapple – Pineapple, cucumber and lemon with a touch of filtered water. My favorite? I’m always a sucker for green juices, so those were my favorite. It was a toss-up between the two. The Bright Greens was a bit sweeter so I loved that it toned down the green-ness a bit, but the Hearty Greens was extra-green and made me feel extra healthy! The Cool Pineapple was a bit sweet and I thought it would make a perfect “skinny” summer cocktail with some rum or vodka and a splash of seltzer. I’ll definitely be indulging in a few summer cocktails after baby P arrives! 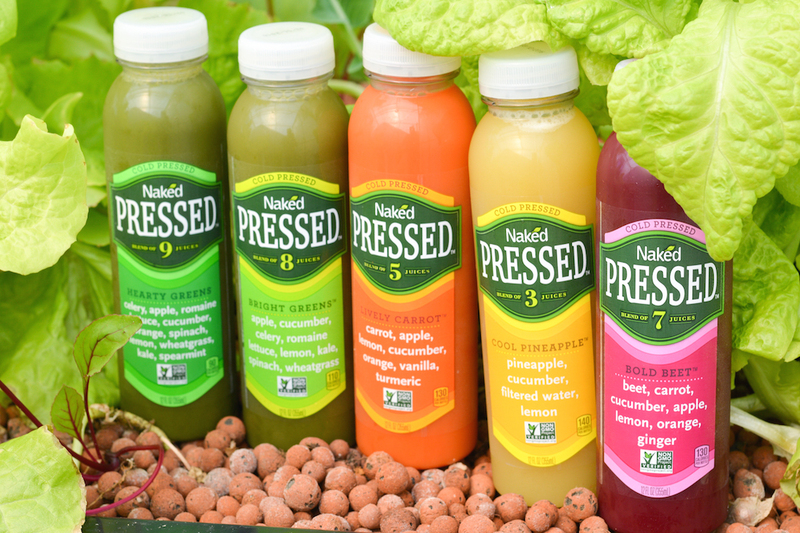 Naked sources the highest quality ingredients available and has used their 30+ years of juice knowledge to perfect cold-pressed technology. It’s so nice to be able to get such fresh juice with only simple ingredients, without having to make it myself. You’ve definitely got to try these babies out when you see them in your local store! So what are all our garden greens going into now? Lots and lots of salads for the lettuce! And as for the darker, leafy greens: I’ve got an awesome quiche recipe coming soon, so stay tuned! I loved the little tour you did of the greenhouse on Snapchat the other day. It looks amazing! So many great veggies for you to enjoy! 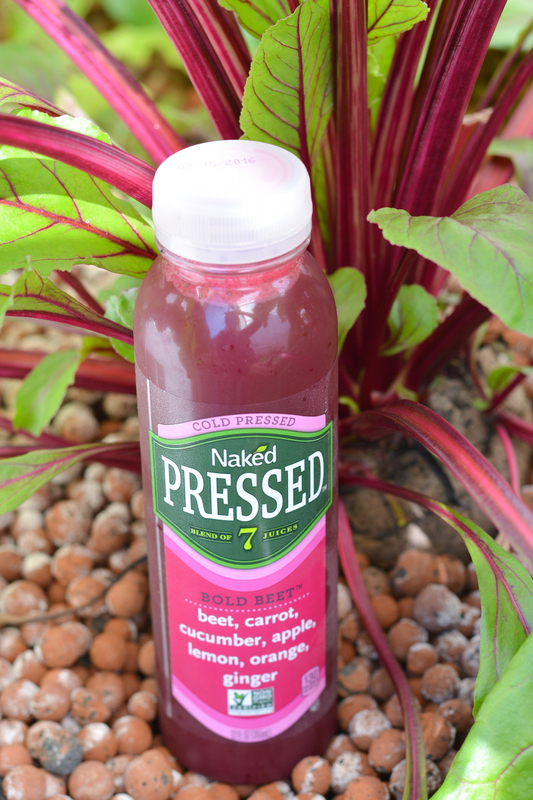 Naked juice is awesome and these look great, especially Bold Beet! I love cold pressed beet juice and this is awesome that it’s going to be available in stores. I have to go to health food stores and pay a fortune for it now. And you are so right about cleaning the dang juicer! I found these at Target, so it’s definitely nice not to have to go to a specialty store!